Today’s deal is a first. 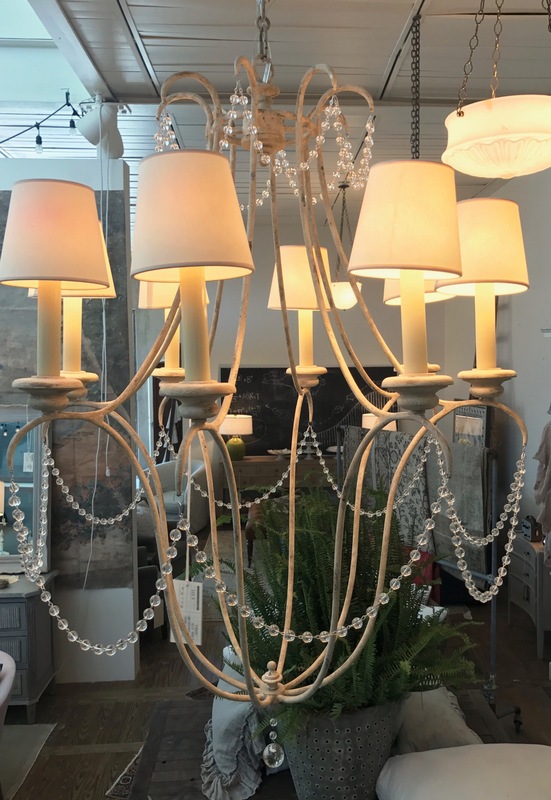 It’s a chandelier! I’ve decided to do something a little different. 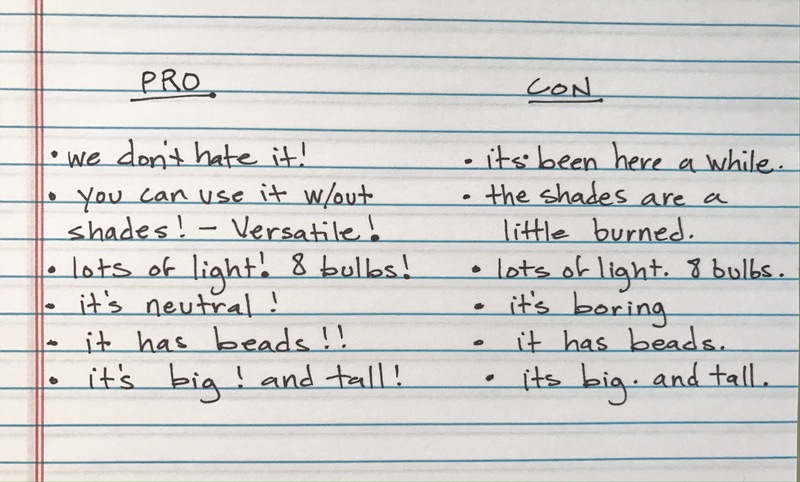 I’m doing this post in the form of a pro and con list! I know! This will be fun! 2. No holds. None. We just can’t. 3. No returns. We never want to see this thing again. ever. And, we want it out of here as soon as possible. Come get it. Please. Did I mention, it’s best to call?? Everyone makes mistakes. The smartest sciencetists﻿, the best doctors, master chefs, brilliant artists. I bet Mother Teresa, at least once, botched something up. It happens. So when we got a swivel glider in a couple of months ago from a fantastic unnamed top notch company, we shrugged our shoulders and forgave. 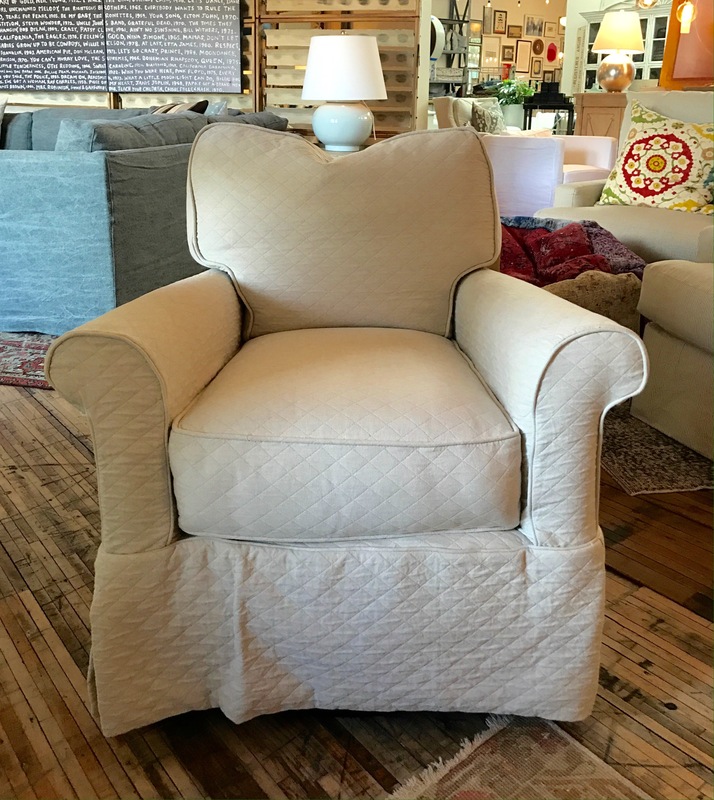 We looked at the half full cup-of-a-chair sitting in front of us and praised it for all the good things about it – a high quality quilted cotton fabric slipcover that you can throw in the wash, great cushioning, the swivel/glider base that makes it versatile and relaxing. It’s a nice small scale and a classic shape. I know what you’re thinking. Either, “Mother Teresa never did anything wrong!” Or “What in the heck is wrong with the chair?” I’ll address the second option since I have absolutely no proof of the first. We kinda think it’s to do with the base….something is amiss. It might just be a matter of the placement of the swivel mechanism that we are too lazy to fix. In any case, it’s just not quite exactly, on the money, right. Sitting in it is not unlike sitting in a dental chair – not like full-on root canal position, more like that moment when the hygienist afixes the bib to your clothes, right before they lean you back for the root canal. So, those of you that have PTSD from a dental experience, stay away. Anyway, like I said, we are too lazy and unmotivated to fix it, plus we have an onslaught of new stuff headed our way, so it’s getting the boot. I sat down to write a Deal of the Week. 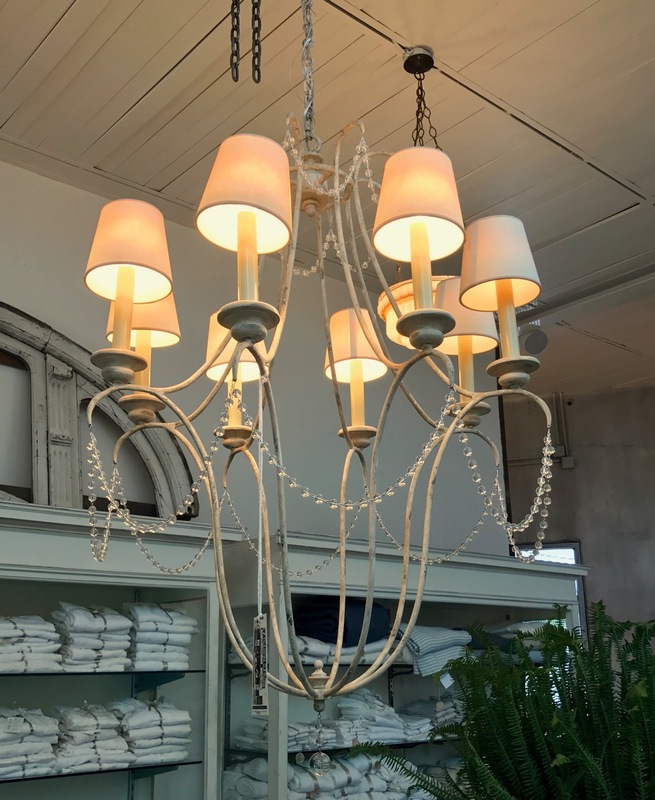 As per usual, we started looking around to find the perfect imperfect thing in the showroom. We all have opinions when it comes to dumping something – and this morning was no exception. But sort of an interesting phenomena occured – everything that was suggested was blue. So, we discussed it and even analyzed it (I know. Surprise. We overthought things.) Anyway, we decided the furniture gods were trying to tell us something…I know it’s not a true miracle. You have to admit, it’s a sign. And we do what signs say, so we decided to put all 5 things on the sale. And so, the Deal of the Week became a Blue Sale. Blue thing 1 – A sofa. And a really cool sofa, at that. I really don’t understand why this made the cut. There’s absolutely nothing wrong with it. 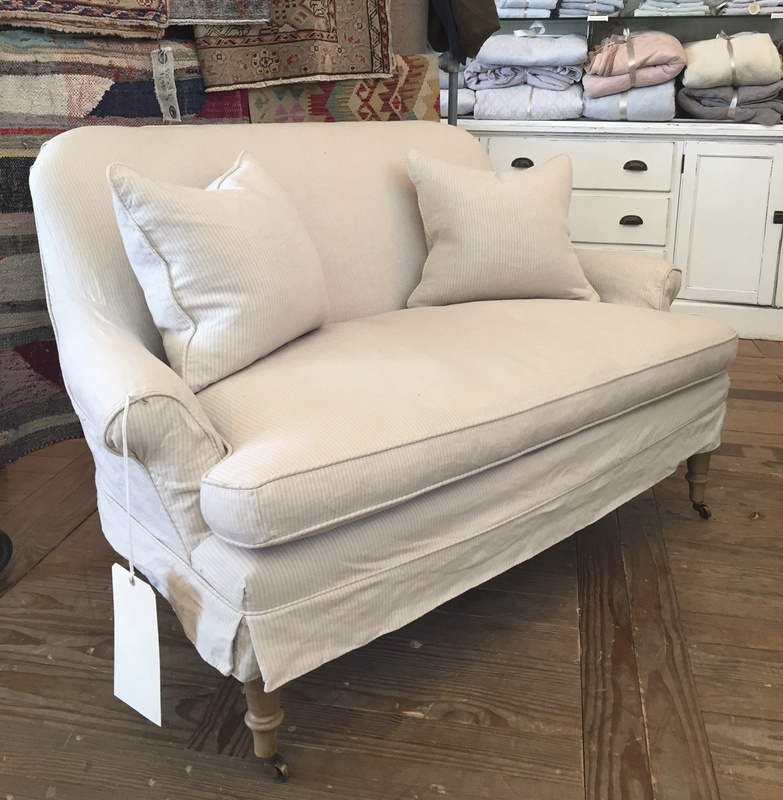 It’s sort of a modern small scale hipster sofa – It’s upholstered in a navy linen. It’s sits on pretty tapered wood legs. Down wrapped cushions. Hand tied springs. A small scale for a small space. 84w,27 1/2h, 34d. It’s a moose! And who doesn’t like a moose? This is something that just arrived, almost, but not completely, in time for Christmas shopping. We thought, a moose will make a great Christmas gift! So we ordered it….like 6 months ago…and it finally arrived…4 days before christmas. Is someone that wants a giant papier mache moose going to wander in in the next 3 days? Uh, not likely. So, our deal today is – a moose! One moose – we are keeping the other. 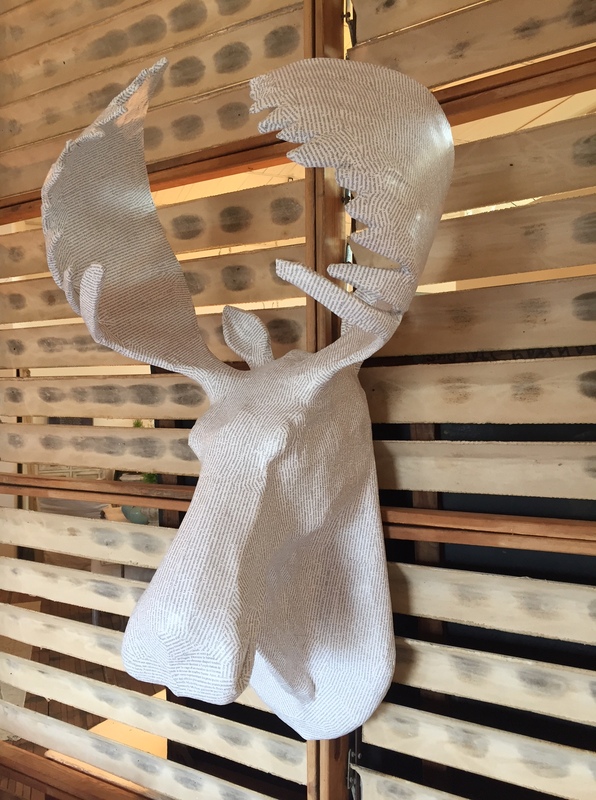 Here are the details – big moose head, 42h 22w 18d. It’s papier mache-ified with french book pages – because for some reason words look pretty in french. Today’s deal is pretty dang great. Just go ahead and call now. Today we are selling a marble top pedestal dining table. 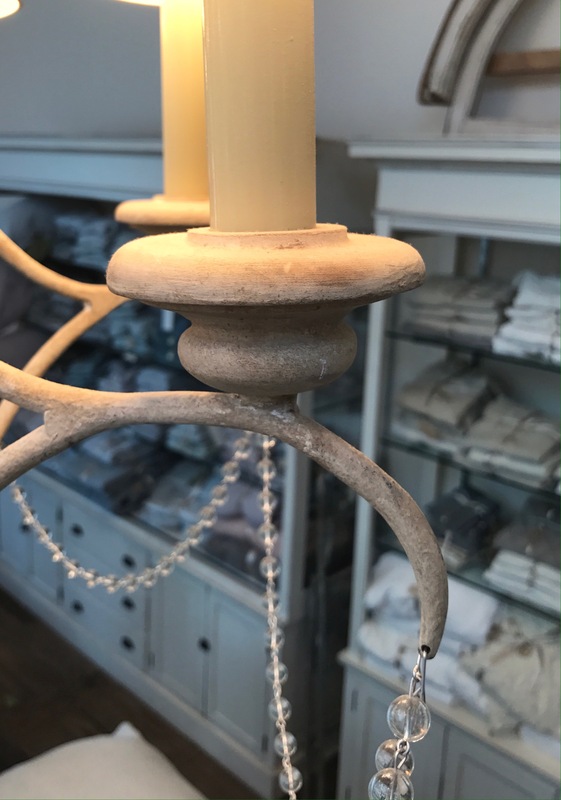 The one and a quarter inch thick slab of solid white carrara marble sits on top of a pretty turned base, that is whitewashed and lightly distressed. It’s beautiful. We love this table. There’s really nothing bad about it as far as style goes. It’s classic, well made, unbelievably heavy – not like something from You-Know-What Barn or You-Know-Wh0 Hardware. But….there’s this one thing. The only slight problem is a scratch on the top…a 2 1/2″ scratch. It’s not particularly pretty, but for the price, it can be overlooked. In a way, it’s a good thing. I mean, whenever you get something new and white, like a white slipcover or a big slab of perfect marble, you spend a few weeks fretting over it and worrying about when it will gets its first stain or ding. Well, we have taken care of that worry – it’s a weight off your shoulders. The damage is done. We should charge more just for the peace of mind. It’s like a gift with a purchase. You’re welcome. original price – $2490 sale price – $600!! This is the victim of a “pair-breaker”. It had a friend and someone bought it. And now it sits alone in the warehouse. Aw, so sad. It’s a small dresser/large bedside. The finish is sort of driftwood-y grey washed distresed finish. Two large drawers and two small. It has some nice detailing – the drawers have a linen texture and a beaded trim. It has pretty turned legs and paneled sides. I guess you could say it is a little french-ish. Only one small issue – the top is a tad scuffed…not scratched. Scuffed – there’s a difference. Well our plan completely fell apart. No surprise there. I would like to place blame with the person the quite suddenly sent me out of town last week (for reasons that I will explain on a blogpost later this week – kind of exciting reasons). This person tends to make decisions and do stuff quite spontaneously. Anyway, I left instructions with said person to continue our deals in my absence, but they obviously failed. So, now that the finger pointing portion of the post is out of the way, we can start fresh with the sale, which is down to 10 days….. if we are really lucky. Fingers crossed. 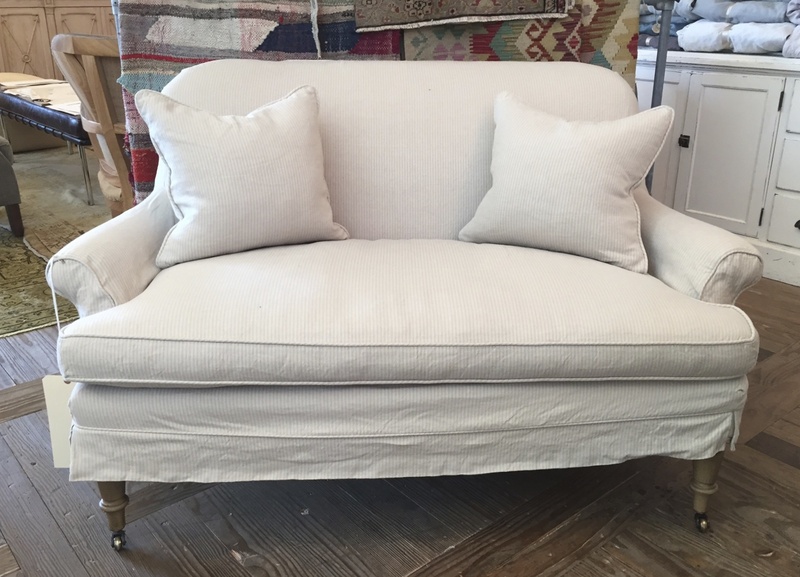 Today we are going to get rid of a super cute little settee. It’s slipcovered in a pinstripe linen – cream and a color called “ocean”, so a pale seafoam-y greenish blue-ish color. This is a small piece. We use it to tuck into corners or put at the end of a bed. Why are we ditching this thing? Well, mainly because we are generous and filled with holiday spirit, secondly, and maybe mostly, because we feel guilty about neglecting our deal promise. Sorry – it sold already. We were talking the other day about how cool it would be to have a deal everyday in December leading up to Christmas. We had this conversation on November the 28th. We said ” We should have a really great deal everyday!” 24 deals! Later in the day someone said “Wait, we aren’t opened on Sunday.” So our total went down to 21. 21 days of deals! Then some whiner (I won’t mention any names) said ” Saturday is really busy. We don’t have time to post a sale and answer all the calls.” Okay, so now we are down to 17 days of sale….okay, that’s still pretty good, considering our more traditional “Deal of the Week” is actually “The Deal of Every Month And A Half Or So”. Well, we all went home, had a Thanksgiving dinner or two, AND leftovers and came back with tryptophan poisoning from too much turkey. We sort of lost our motivation. The 1st and 2nd went by…. and a weekend, and now we are looking at 15 days of Christmas deals, but 12 Days of Christmas sounds so much more iconic. So, I’m saying 12 – 15 days, because it sounds better and we will be able to miss a couple and no one can complain because the name of the sale is charmingly vague. So, here’s our first deal. It’s actually something we had on our Instagram sale. I know, it’s kind of like regifting, but there you go. This is a pair of slipper chairs, meaning armless chairs. 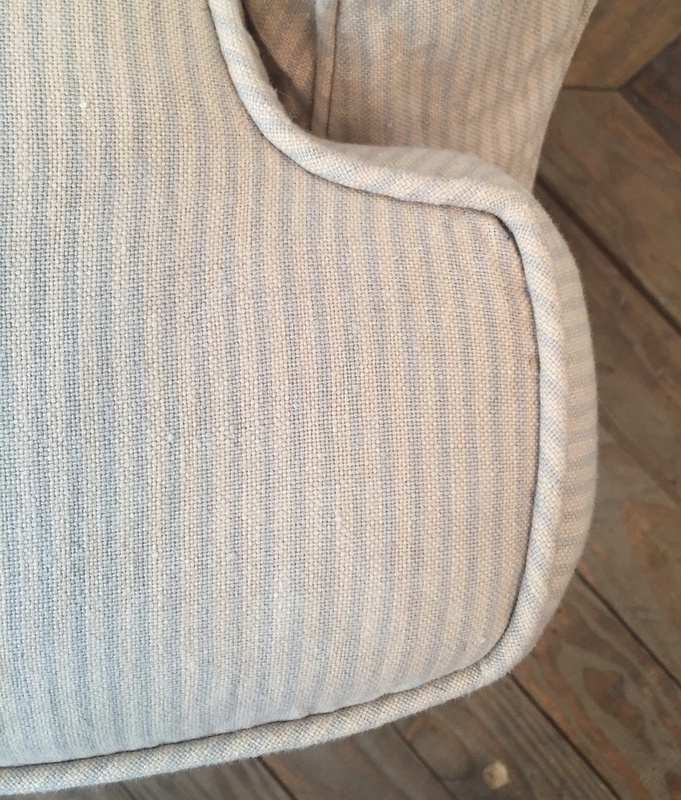 They are slipcovered in a really cool washable stripe cotton- kind of light blue-ish grey and grey on a light background. In fact this material is made in a micro-mill somewhere in Spain. Yes Spain. There is nothing wrong with these chairs except that we ordered too many of this frame – and we just don’t have space. 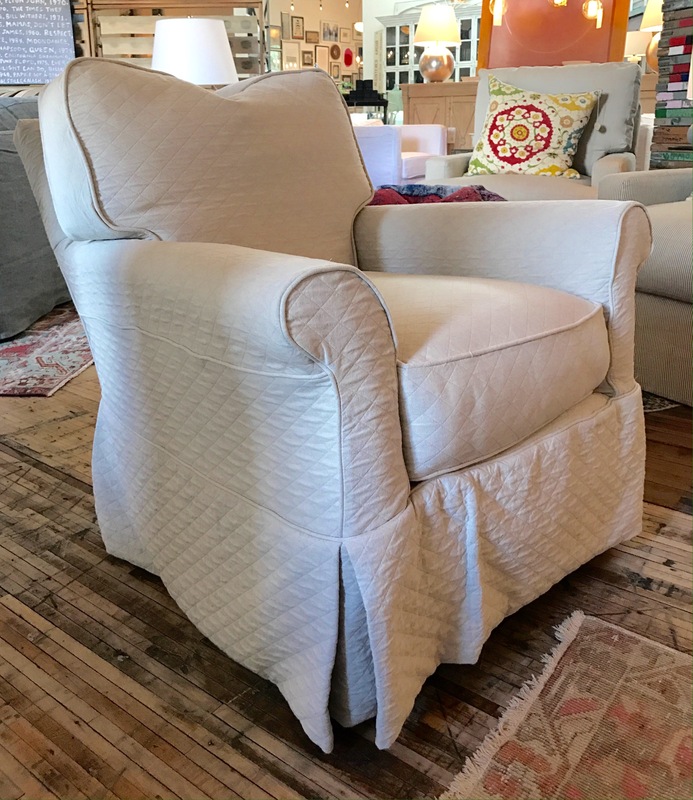 Now, here’s a secret – if you don’t like the fabric, at this price you are coming out so so far ahead that you could order a new slipcover and still be getting a heck of a deal. So remember that when looking at them. No one bought them on our Instagram sale – so we are going to knock off even more off the price – a lot more. Now please, for the love of Christmas, buy these dang chairs. original price – $1290 each sale price – $600 FOR THE PAIR!!! Happy Friday everyone! It’s Deal of the Week time. Today is a great day, for you anyway. You see, we had a “designer” who ordered a sofa, an expensive sofa… then the client freaked out and and decided that the best course of action was to dump it back into our laps. Well, we unfortunately took pity on her, and took it back. And now, we are sitting here looking at this thing and we really don’t so much want it. It makes us nervous. Really $7000? Therefore, we want to dump it in your lap! Please take it away. We want to forget this ever happened. Now for the details. The frame is great – it’s a classic tuxedo style sofa with a bit of tufting – cut and sewn style, if you want the technical term. The seat is a down-filled bench cushion – which means one long seat cushion. I personally love a bench cushion. Typical of our sofas and chairs – it has a hardwood frame, 8-way hand tied springs, and it was made right here in the USA. A masterpiece by journeymen upholsterers. But here’s the really great thing about it – it’s leather! A soft butter-y smooth leather – which… is the not so great thing about it. I mean, unless you have no dogs, no cats, no children, no keys sticking out of your pocket or any from of rough-housing and chaos in the room. No horse play on this sofa – It’s kind of a diva. Because, well, it can scratch…pretty easy. And one more thing – the color… it’s called Pistachio….it’s not really green…it’s more of a toffee color, with a touch of a subtle green undertone. So in certain light, say fluorescent, you might draw out the green in a way that is not pretty. But, at this price, I think you could learn to love it. I know, we need to call it the Deal of the Month, or the Deal of the 2 Months, but that’s just not catchy. Today we are trying to squeeze more furniture into the showroom than the fire marshall will allow, so we need to dump something. We picked the biggest, deepest chair in the store. And really one of the most comfortable – and that’s saying a lot, because you probably know how many comfy chairs we have. It’s slipcovered in a washable fabric. Its large scale, and down wrapped cushion and giant down pillow make this a curl-up-and-read-a-long-book kind of chair. About the scale – This chair is a monster – its 36″ wide, and 44″deep. Please make note of the size before you buy this for your 600sf New York loft apartment. It will fill a space. It’s big. Really. I mean it. Now let’s discuss the fabric – first, let me say we plopped this chair in the showroom in the spring when we were thinking of summer homes and beach trips. This chair with this fabric belongs in the Hamptons. It’s got the whole coastal Maine/Martha’s Vineyard/ Kennedy Compound kinda vibe. And I really feel like i need to say – it is a dark navy stripe – just in case your monitor or screen reads black. This fabric is New England island, not Riker’s Island. Got it? 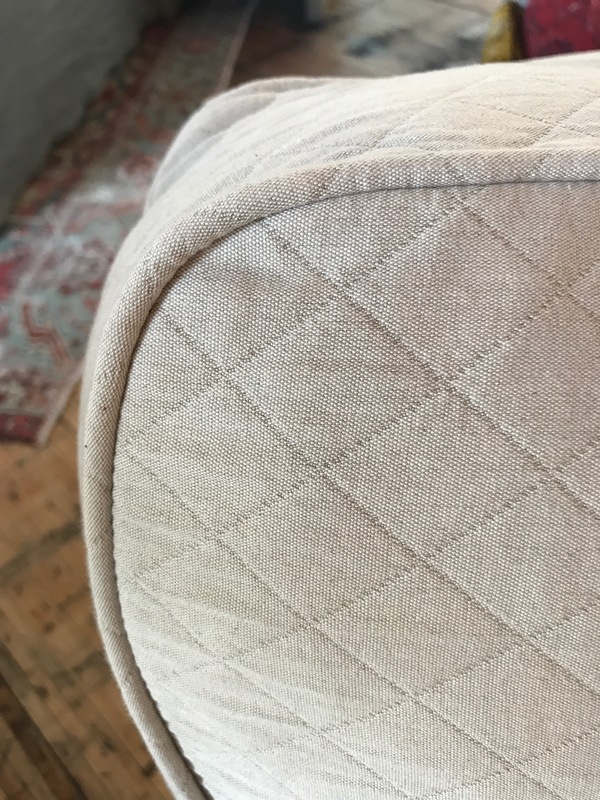 And I say this all the time when we sell a slipcovered chair – with the deal you are getting, you can order a new cover and still come out ahead.